“Who Will Fill Your Shoes” by Colette Marshall. Recently, the Door County Women’s Fund had a call for art to find an image to grace the cover of their 2014 Women’s Fund of Door County Tribute book. 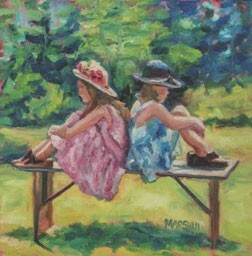 The selected image was an oil painting titled “Who Will Fill Your Shoes” by Colette Marshall of Fish Creek. The Door County Women’s Fund will sell 30 to 40 prints at their “Celebrate Women Luncheon” on Aug. 13. The prints will be on sale for $75 each with 40 percent of the proceeds going back to the Women’s Fund as a donation.